The story is set in a class of art students in their final year of university. The students all have anxiety over final projects, the evaluation of their year’s work and a coming exhibition of that work. 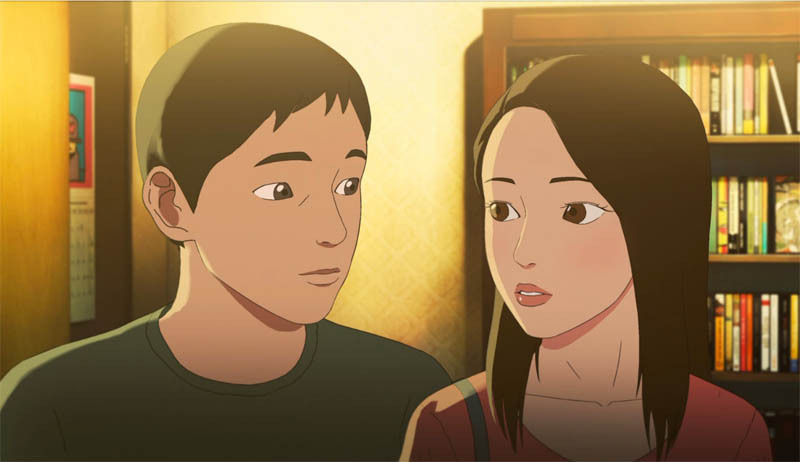 The main characters are the quiet, slightly nerdy Jung-woo, his loudmouth, jerky friend Dong-hwa and pretty Ju-hee, who concentrates on her work and is rather quiet herself. Some classmates assume she’s a snob because of that. The female students talk about her behind her back, but they put on friendly faces when they want to know where she bought her handbag. Jung-woo has had a crush on Ju-hee for a long time. Maybe it’s more like an obsession. She appears as a delicate, ethereal angel in an online cartoon he works on regularly, while he portrays himself as a scrawny, caring, sensitive merman. (Really!) In many belief systems, angels protect us, but this angel seemingly needs the protection of Jung-woo’s alter-ego. In real life, Jung-woo can barely say hello to Ju-hee. Jung-woo and Ju-hee get to know each other better when he discovers something about her and she begs him to keep it to himself. He agrees to do that, but can he keep his mouth shut? And since he made this discovery while doing an errand for Dong-hwa, it’s quite possible that Dong-hwa will find out, too. We’ve got some tension, now! 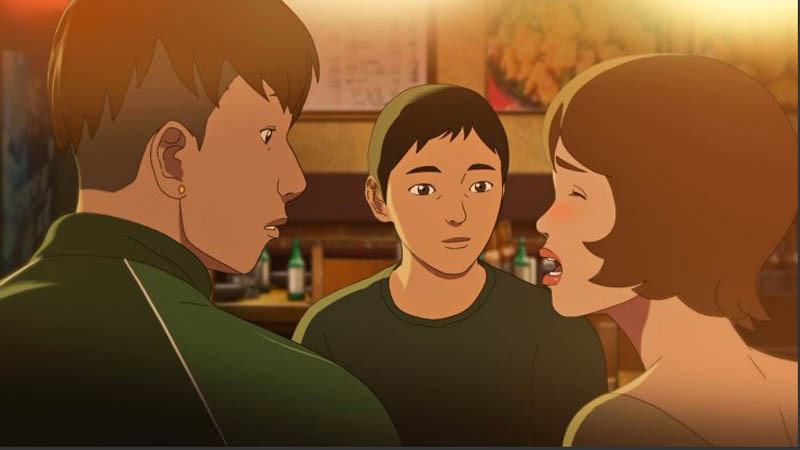 In the animated Korean film The Senior Class, Jung-woo, centre, is quite literally stuck in the middle of a dispute between his jerky friend Dong-hwa, left, and the young woman on the right, who was seduced and then rejected by Dong-hwa. The Senior Class is distressing to watch, because there is so much meanness and betrayal in it. There’s also some “cutting off your nose to spite your face” behaviour, that makes no sense, logically, but people do act illogically all the time. Though The Senior Class lacks the physical violence seen in the other films written by Yeon Sang-ho, it is like them in that it exposes a rampant hypocrisy that is hardly unique to Korean society. Gossip is harmful, but hypocrisy is so much worse. Director Hong Deok-pyo will attend the screening and answer questions after. I’m sorry that I did not ask one myself. A certain character reminded me of Marilyn Monroe. I wonder if that was an intentional thing, or just my imagination? I’ll try to find out before he leaves! (The last time I thought I saw something in a Korean film, it WAS all in my head! At the Q&A for The Senior Class: Fantasia International Film Festival programmer Rupert Bottenberg, translator Noeul Kang, and director Hong Deok-pyo. The Senior Class, in Korean with English subtitles, 82 minutes long. The Senior Class will be shown Monday, July 17, 5:10 pm, Salle J.A. De Sève of Concordia University, 1400 de Maisonneuve Blvd. 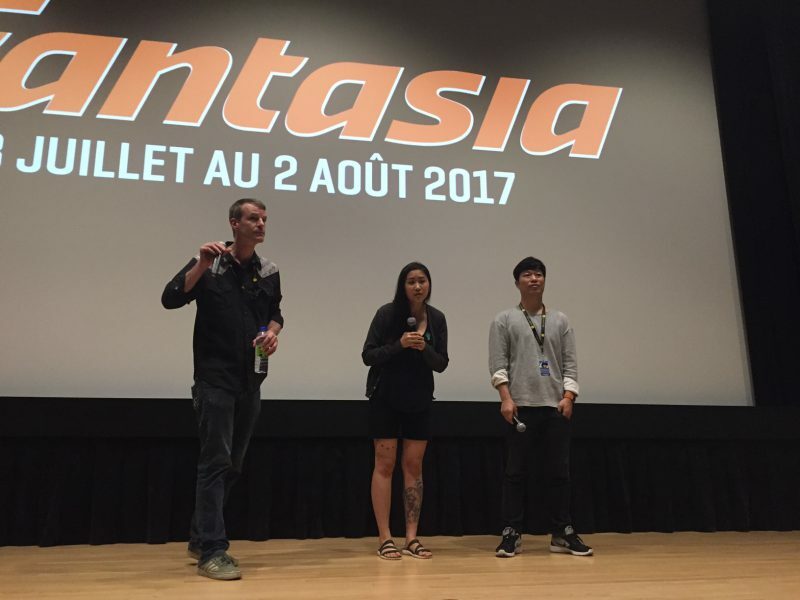 W., as part of Montreal’s Fantasia International Film Festival, which runs until Aug. 2, 2017. Visit the Fantasia web site for more information.